When stuff doesn’t work, we either play Mr. Fixit or call someone. Whether it’s a job for your auto mechanic, furnace repair technician, or electrician, the expert usually has a good idea of what’s causing a particular problem. But sometimes malfunctions are real puzzlers. From the 1870s well into the 1900s, mystery surrounded many incidents where faucets or pipes were opened but the water didn’t flow. When that happened, there were real consequences: a factory couldn’t operate or a school might close. For citizens lucky enough to have running water in their homes, it meant going without — or, if it were available, hauling water from community wells. For a plumber, the natural assumption was that a clog was the culprit — a piece of clothing, a collection of sediment, or an accumulation of greasy materials. When nothing of the sort was found using the usual tools, a difficult search ensued — unless plumber was experienced. In that case, he might have suspected eels. If you’re squeamish about creepy, crawly things, then you’re probably wriggling (like an eel) at the discomforting thought of eels in your water pipes. 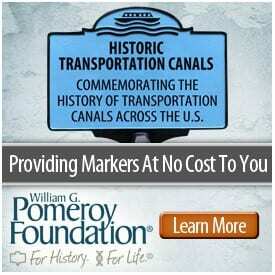 But it was once a thing, a problem familiar to engineers who designed water systems and the men who operated them. Population centers with water intakes drawing from large bodies of water were the most susceptible, but because eels are so adept at traveling up rivers and smaller tributaries, the problem could pop up at unusual locations. As a private homeowner, imagine live critters coming out of your open faucet! Ogdensburg, located on the busiest eel waterway in North America, the St. Lawrence River, had plenty of problems as well. Eels come in all sizes, and the smaller ones tended to reach the narrower pipes that supplied private residences. A typical example in the Ogdensburg Daily Journal (1881) involved a plumber removing a foot-long eel that had clogged the pipe in a private home. Homes were frequently affected in many communities, and for a long spell it was grudgingly accepted that having the occasional critter blocking a pipe or tumbling from a faucet was the cost of having running water in your home. Companies also felt the impact of slimy invaders grinding business to a halt. Some great examples from northern New York include: in 1872, the Corning mill at Troy was shut down for three hours until a five-foot-long eel was removed from a water pipe; in 1880, a four-pound eel was found blocking the flow of water in a Troy hotel; and in 1881, a dead eel stopped the flow in the water pipe of the Oswego Times. 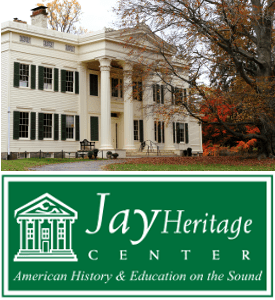 During the summer of 1894, the janitor at the Mechanicville School was notified that a faucet in the building was clogged and was emitting a terrible odor. A dead eel, about eighteen inches long and barely fitting within the pipe, was found to be the cause. The real hotspots for eel problems were big cities like Boston and New York. There are far too many incidents to mention, but a sampling shows some of the extremes that occurred. 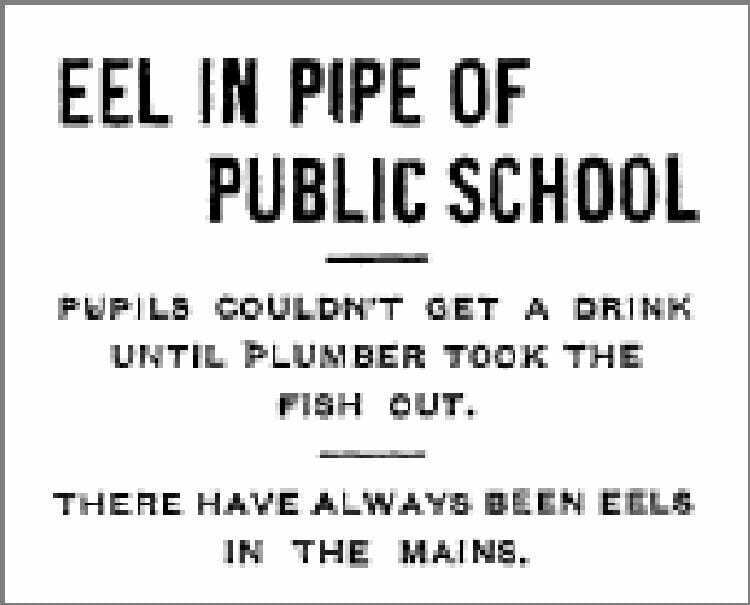 During the summer of 1870, there were 186 incidents of eels plugging water pipes in Brooklyn. Pavement had to be torn up in each instance to access the pipes, costing the city the 2017 equivalent of $40,000 to $70,000. In 1895, street lights, homes, and stores in Stamford, Connecticut, went dark for two hours when an eel blocked the electric light plant’s water-supply pipe. In 1902, 137 men at the Barrett Manufacturing Company in Brooklyn were idle for more than four hours during the effort to remove a 33-inch eel that had blocked the two-inch water line feeding the boilers. The company assessed their lost time at $300 to $400, equal to approximately $10,000 in 2017. In 1904 at Poughkeepsie, every faucet in Public School No. 3 went dry. Pipes were cut and a large, dead eel was found blocking the main line entering the building. The Evening Enterprise noted, “Superintendent Smith thought it a pretty good indication that the standard of public education in this city has been raised several degrees when even the fishes try to get into our schools.” Too bad he didn’t think to mention fish traveling in schools! At any rate, Poughkeepsie’s superintendent of public works was not the least bit alarmed at the school issue, according to a published interview. In 1905, an eel said to be 35 inches long and eight inches in circumference brought the Baltimore city-hall elevator to a halt by blocking its water supply (the elevator was hydraulically operated). Church pipe organs, many of which were powered by water (they were called water organs), often fell victim to eels in the water pipes. And in that vein, a perhaps exaggerated article from 1908 described the effect of an eel invasion in one city. 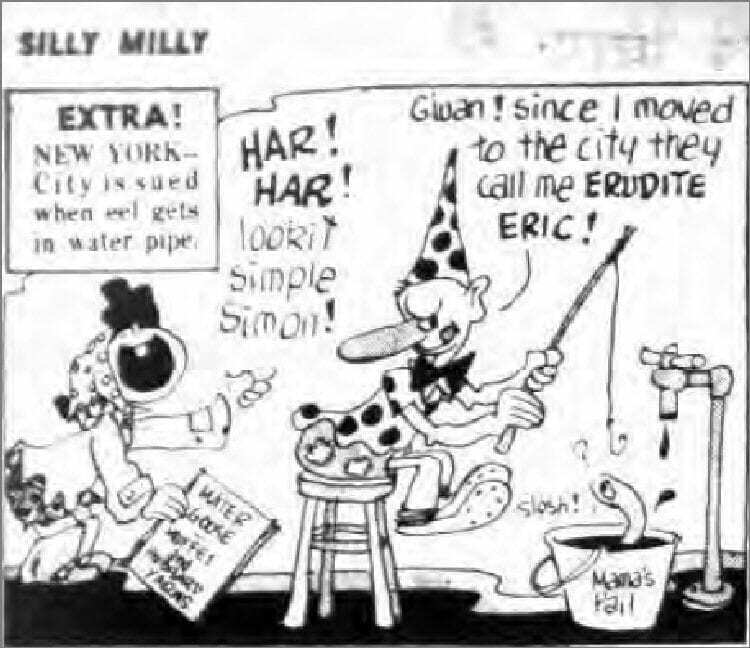 In 1912, even the mighty Waldorf Astoria Hotel had to call in plumbers to remove an eel from a pipe, and in 1923, several miles north of West Point on the Hudson River, an entire business block of Beacon was without water for a week. A street was finally dug up to access the main, which was found blocked by several eels. While it sounds unlikely, many water management officials concluded over time that very small eels entered water systems through screen mesh that was meant to keep them out, and then grew too large to escape. No other explanation seemed plausible as to how eels of all sizes, and sometimes quite large, were gaining access. That same conclusion was reached in New London, Connecticut, in 1923, when a number of water outages plagued the city. Newspapers carried the following story. Modern developments gradually reduced the problem of lines clogged with eels, but as late as 1940, the National Gypsum Company’s $4 million plant in the Bronx was closed for ten hours until a 36-inch eel was found blocking a water pipe. 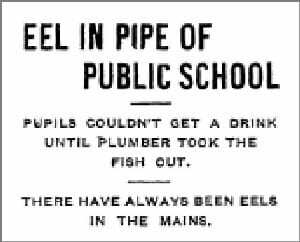 But eels in pipes aren’t always a bad thing. The concept has been used to help eels bypass dams, which have severely altered their range around the world. In several countries, the eel-pipe connection is used to feed families and earn income. Check it out. You’ll find this video, plus this one, and others like them, that reveal simple but ingenious methods of gathering a day’s catch. Photos: American eel; three stages in a young eel’s life courtesy NYSDEC; headline in The Evening Enterprise, Poughkeepsie, 1904; cartoon about critters emerging from water pipes, courtesy New York Post, 1943.